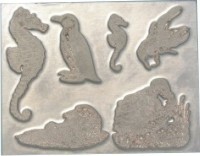 The MAGNESIUM MASTER PLATE is a one-time item used to form the matrix mold. Three thicknesses are offered. "Standard Etch" will create stamp printing characters that are about .040" high, suitable for most "business stamp" type of applications. "Deep Etch" will create stamp printing characters that are about .070" high which is most common for "art stamp" applications. "Extra Deep Etch" makes stamp printing characters that are about .100" high and are used for stamping on cloth, corrugated cardboard and other irregular surfaces.